This thread is a forum to discuss the best cushion tech on the market today and juxtapose current offerings with classic shoes that have got the job done in the past. The inspiration for this thread was my chronic issues with shin splits that can almost certainly be attributed to running on hard courts during my collegiate tennis career. I hope to see more advancements in cushion tech for tennis footwear. Especially in the forefoot area, where cushioning in tennis shoes seems to be omitted the most often. I find it hard to believe that consistent forefoot pressure against concrete doesn't deserve more careful consideration from footwear manufacturers. I find it hard to believe that Nike, adidas, and other manufacturers are removing forefoot cushioning to benefit "court feel" or "flexibility"... If you are living in the US, chances are you play 90-95% of your tennis on hard court and more specifically concrete. Ample forefoot cushioning is essential to injury prevention and footwear companies should make this their top priority when constructing tennis shoes. for me, the best cushioning was in the Reebok Bonzers. It's been tough since then finding something comparable; I've even tried the vaunted Asics, but they still lack the right kind of cushioning, and a bit light on the overall support aspect, too. Just did a google search on the Bonzers, looks like quite the beefy midsole - which provides a lot of impact protection. It seems that Nike has grown lethargic with their cushion tech. Hopefully they will bring their shoes back to the 2007-2011 level of cushion. It is to the benefit of all athletes. I can also say that Adidas has been one of the worst in terms of cushion tech that I have used and their only answer to creating tennis specific footwear is to load the midsole with thick, hard, rubber compounds that improve durability ---- not exactly what a high performance tennis player needs. Makes me wonder if top tour guys are getting custom cushioning systems..
"Yonex". Period. And seriously, there isn't only Nike lines in there, there are other shoes from other brands. I also feel that TW could place a heavier emphasis on cushioning in their shoe reviews, as they seem to simply breeze over that category at times. Also, it would be useful for comparisons in cushion systems. Are you wearing the power cushion? No longer. I'm using Lotto Ultra Raptor IV. That said, the Power Cushion is easily the most cushionned shoe I've ever worn, period. Thanks for the suggestion. Ill try and grab a pair on sale. Hows the Raptors cushion system? Is the Power Cushion cushioned from heel to toe? Can anyone comment on the Gel Resolution 5 cushioning system? Less dampening than the Yonex shoes, but still good IMO. It's a firmer, bulkier ride, but still feels fast. The SynPulse heel cushion is pretty good IMO. I don't have as much experience about these shoes, but it was discussed on the forum a lot. You should be able to find answers using the "Search" tool (include "GR5" as a tag too). Most definitely. Most of the top pros, like Federer and Nadal, get custom made shoes specifically customized to their feet with the exact amount/type of cushioning they want. It makes sense. Although, take a look at this article put together by ESPN - and just look at the men for the sake of consistency. More than 77% (17/22) of the injuries listed in 2014 are lower extremity injuries which can largely be attributed to poor sport-specific footwear (due to the fact we know these guys are stretching 1-2 hours a day and have personal physios that are keeping them on-top of treatment/icing/etc). Injuries are inherent to any sport, but the fact remains that the ATP tour is a largely played on hard courts, and we've heard Rafa rant on and on about the apparent disparity in surface usage at ATP events. And -- Rafa is the most ideal victim of lower extremity injuries we have present in the top 20 (besides Haas and 2 ankle surgeries). Top athletic footwear firms, (Nike, Adidas, etc) have an obligation to the athlete to protect them from the risks they will encounter in their individual sports (i.e. Basketball shoes developing larger ankle collars to prevent rolling of the ankle on rebound or during a slash to the rim). Why aren't we seeing more cushion as an emphasis in modern day tennis shoes!?!?!?!? If we can get to the moon, we should be able to protect our knees, ankles, and other joints from the impact of pounding on concrete. Well, as much tennis as these pros play and train, especially on hard courts, I think many of them will get lower extremity injuries regardless of the amount of cushioning in their shoes. They just run and pound their feet/legs way too much day in and day out. And too much cushioning is not always a good thing. You could lose your balance and cause you to roll your ankle. Your feet squashing down every time you take a step could slow you down. The most cushioning shoe I have ever worn was the Reebok Match Day Pumps. I hated them because not only were they way too heavy due to all the cushioning, but they actually made my knees hurt, believe it or not. I think it was because every time I took a step, my knees were getting compressed due to my feet moving downwards while squishing down on the abundant cushioning. That and the forces my knees were dealt with while trying to balance my feet on the cushioning. Counter-intuitive, I know. I don’t care about the cushioning so much, but the durability of the so-called “6-mo guaranteed” shoes has been steadily going down the sewer. Barricades, Fila, Assics, all last 4 – 6 weeks at most of not even hitting every day!! Thanks for your analysis, BP. By no means would I isolate lower extremity injuries to the volume of cushioning in tennis footwear. I play at the collegiate level and experience they pounding these pros fewer to, and I sympathize with that. But, it's difficult on my college student budget to sample shoes and venture out of my comfort zone (Nike) to find what shoes provide the right amount of cushioning on hard courts. I also have strong feelings about the "weight reduction" technique of removing forefoot cushioning. I am sure there is such a thing as too much cushion, but I find it hard to believe that leaving key footwear tech out of a "high performance model" like a Nike Air Max Cage or Vapor is beneficial. That's just BS. So I guess my gripe is more with the way that Nike has handled "developing" their footwear, and that has sort of flooded into my feelings about hard court prevalence on the tour and it's associated risks. 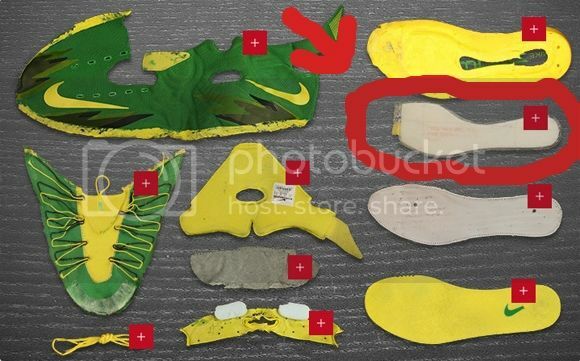 Nike is a specialist at this: Federer and Nadal indeed wear customized version of their shoes. Serena's shoes aren't even available. Li Na's shoes aren't sold anymore but she keeps wearing them. However Federer doesn't wear insoles: he wears two pairs of socks instead. So YMMV. If you really care about cushioning, you're better off looking into cushioned insoles, which will provide much more cushioning than any bone stock tennis shoe out there regardless of Air Max, Gel, Power Cushion, or whatever. They make a very substantial difference. Just be forewarned that the tradeoff for many of these insoles (like the Sof Sole Airr Orthotics) is that they are relatively thick and will make the shoe feel tighter and lift you a bit higher off the ground. Then again, that's usually the tradeoff anyway if you want more cushioning v. a more lower to the ground, fast/speed oriented performance shoe. I agree and also started to notice it toward the end of last year. A forefoot pain was developed last year 1st time in my life. Noticed thin forefoot layer in Babolat Propulse 4. But I thought it was mainly an aging symptom (of my body ). Took me 4-5 months to heal it with shoes with extra cushion insole. Is it just a coincidence to read it now ? I think part of the issue is that people will disagree about "proper" cushioning. Cushioning generally tends to diminish performance by 1) making shoes too soft and therefore less responsive, and 2) lifting the foot bed and making shoes less stable. I find Yonex the best cushioned shoes in terms of dissipating shock, but not too soft to slow me down. They do sit higher than I'd like but I love the fit of 254Ds and PCDs. I've never noticed forefoot cushioning to be an issue with any tennis shoe I've used, that is in terms of too little cushioning. I agree with you. I think Max Air is the best technology that Nike has ever come up with. It should be in every Nike tennis shoe. I've never been a big fan of the Vapor line because they lack Max Air and just don't provide as much cushioning and support as the shoes that do have Max Air. Nike's best tennis shoe of all time is easily the original Breathe Free II. They've never made a better tennis shoe than that ever since. If Nike were smart, they should just bring back the Breathe Free II exactly as the way it was without any changes whatsoever. It was the perfect tennis shoe - light and supportive at the same time. I'm sure they still have all the original molds, lasts, etc. to make them. Just bring them back in dozens of various colorways and they'd sell millions of them. If you believe you're being slowed down by a cushioning system, I don't think the shoe is the issue. Foams and cushion systems are often the lightest component of an entire shoe (think lightweight eva foam, gel, and essentially wide open holes in Nike air). So, with that being said, most shoes and their cushion appear to be an afterthought for these companies (can't speak for Yonex or Asics). I appreciate your Yonex suggestion, and I've seen post after post that speaks highly of their cushion. Glad you brought up the Breathe Free II. Fantastic shoe and while I was only 11 years old when it released, I do recall having a few pairs. I agree that Air Max, as a full-footbed cushion system is hands down the best cushion technology I've used. The Air Max Cage is built on the BFII last, which is great for a person with wide-feet like me, but unfortunately Nike decided to just stick with some standard EVA foam in the forefoot. I have hope that they will continue to use the BFII last and make changes to the cushion system, but who really knows. The Vapors have always been more of a stylistic statement for me, but they also have consistently been the lightest option on the market for me (way lighter than any adizero or feather shoes I've owned, and I played in 2-3 pairs of adizero feather ii's) -- so I agree that Nike needs to beef up the cushion, by at least providing a full-length zoom bag in those shoes. If you want some fancy sort of cushioning system in the forefoot, the Sof Sole Airrs have gels in the forefoot. I've used them in some shoes which I felt needed more cushioning. They are thick though. Pair them with some thick Nike Elites or Thorlo 3s and you'll have a crapload of cushioning, although that would be too much in my case. And yes, there is such a thing as too much cushioning coming from someone who's had an ACL reconstruction and part of my meniscus removed. As previously mentioned, the Reebok Matchday Pumps were ridiculously cushioned. Felt like pillows on my feet, but yet it caused me knee pain because of the excess softness/squishiness (in addition to feeling like bricks as they were over 20 oz and had no ventilation to speak of). I have a friend who swears by Cadence insoles, but I've never tried them. I have not tried the Spenco insoles. I think part of the issue is that people will disagree about "proper" cushioning. Cushioning generally tends to diminish performance by 1) making shoes too soft and therefore less responsive, and 2) lifting the foot bed and making shoes less stable. . This is exactly right. Cushioning vs. stability is always a trade-off. There are dozens of running shoe lines created by each manufacturer to address different niche stability levels for runners and cushioning is always reduced with the stability shoes. With side-to-side stability being even more of an issue in tennis, I'm guessing most manufacturers prefer to minimize the cushioning in favor of stability and increase the durability of the outsole (which also raises the shoe). You can't have everything. A shoe can not be durable and lightweight or cushioned and stable all at once. Something has to give. OP should try other brands or OTC insoles or wear two pairs of socks. You're playing a lot of high level tennis so you are working through shoes at a faster rate than the average bear. Do yourself a favor and buy a pair of Cadence Insoles! That will solve most of your problems! I use them in all of my tennis shoes and they do wonders! If you want some fancy sort of cushioning system in the forefoot, the Sof Sole Airrs have gels in the forefoot. I've used them in some shoes which I felt needed more cushioning... And yes, there is such a thing as too much cushioning coming from someone who's had an ACL reconstruction and part of my meniscus removed.. I have definitely run into many problems trying to fit my foot into certain shoes with the additional of a thick insole, and Nike elite or other thick socks. I will look into Sof Sole Airs, although I am hoping to find an thinner insole because my wide feet can experience problems with thicker ones. I agree with you there is a trade-off when applying more cushion or beef up any attribute for that matter, but I don't think there's a valid excuse to omit 21st century tech in the forefoot where tennis players apply 90% of their pressure. I also agree that you can't have everything, and it the case of all competitive tennis players, durability is something I personally am always ready to sacrifice to gain a more comfortable and better performing shoe. I will look into asics and OTC, thanks for the suggestion. Will look into Candence, I appreciate the suggestion. 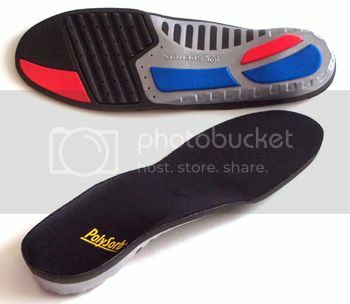 After tearing my plantar plate twice last year, I searched everywhere for insoles with serious ball of foot cushioning. They aren't out there. I ended up with a set of $400 custom built orthotics. They are awesome, but finding a shoe to fit them then became a problem. I ended up with the Prince T22 Mid. I chose the mid because my narrow heels were slipping out of most shoes with the custom insoles installed. With the Mid, the fit is perfect. They have lots of room in the toe box, too. The thing is you've only mentioned Nike shoes and your experience with them. It's not like that for every shoes or every brand. Glad for you that you're going to look at other models from other brands. Ever since they went to that Low to the ground feel, they started using these thinner cushioning system. Companies like Nike were forced to use Thinner cushioning but Better cushioning system. They tried very very hard but they are still trying to match the great cushion of the past like air max. Loads of bubble bursting issues for more competitive players with Max Air, especially on the 4.3 model. That rarely happened on the Breathe Free II and the Breathe Cage II, in my experience. And if it did happen, the soles were pretty much worn out by then anyway. Am in complete agreement with the OP. To me, when a shoe company writes about "court feel" that's code for "no cushioning." I always use the cushioned heel inserts that you get at the drug store in every pair of tennis or running shoes. Seems to make a difference in reducing joint aches. I think alot of it is because of the "barefoot running" fad which is imo one of the most stupidly damaging trends I've ever seen (unless you are under 8 stone). It'll pass I'm sure. I use the Nike Air Monarch with an extra insole (I buy the shoes a half size too big) and haven't had foot or knee problems since starting this way 7 years ago. Prior to that, lots of problems. Huh? I think that the barefoot running trend has absolutely nothing to do with the current state of tennis shoes (though I wish it had more influence). Nike's barefoot-style shoes are the Nike free stuff. I don't see why you think barefoot is damaging? First of all, you can get heavily cushioned shoes if you'd like them. Don't know where you come up with the 8 stone limit? I think I know what a stone is (about 14lbs) and I weight a lot more than that and can easily run barefoot without problems. Glad to hear you've searched for similar types of insoles, it looks like Spenco offers a gel line that might have enhanced cushioning in the forefoot. I don't think Eva foam is better than any cushion system nike employs (air, air max, lunar, zoom air). I also think inserting solely Eva foam or adidas adiprene Eva scheme in the forefoot is not enough cushion for hard court training and contact with a concrete surface. I've included a heavy amount of analysis on my experience with Nike, and I believe their shoes to be a representation of the market offerings. I've used the adidas barricade 4-6, and extensively used the adizero feather 2, and I've mentioned in multiple posts my frustration with their cushioning tech. Nope. But not even close. They may be with Adidas one of the most popular brands, but they do not represent the great variety of what's actually on the market. For example, TW proposes 15 (!) different shoes brands just for men, and a even greater variety of models. Excluding Nike, Adidas and Lacoste (because barely anyone plays them), that still leaves 12 other brands to try. Well, that's a great thing to hear. I am hoping to be able to snag a pair of Asics Gel Resolution 5s by the end of the month. I am not only excited about their forefoot and heel gel cushion system, but I am stoked for the memory foam in the heel. Does anyone know why Gel insoles are significantly cheaper than regular synthetic ones???? Do they offer a less durable cushioning system and compress over time? At the very least, try the Yonex shoes. Whether you buy them or not isn't that important, but you won't regret trying them if you love cushioning. EDIT: I also mainly had played in Nike shoes so far, and I swore I wouldn't try a pair of those flashy Lotto shoes despite the good reviews. I once went in a sports shop, noticed a pair of Raptor IV in my size on clearance in flashy yellow, tried about every other shoe before even considering trying the Raptors. I left the shop with them; the fit was just perfect. And they still haven't disappointed me so far. I'm not telling you to try the Raptor, but just to try more shoes brands. You may have a great surprise. Go to a sports shop and try every other shoes just for the sak eof it. Although, I have to say, at this point in my tennis career I have developed a connection to the Nike brand. The swoosh symbolizes much more than just a logo or something that Federer or Nadal wears.. the Nike swoosh symbolizes a ton of junior matches I have won, high school matches my team has battled in, and many training sessions that have developed me into the player that I am today. I have a hard time straying from something I grew up with in the latter stages of my collegiate career. Your irrationality with respect to shoes shows why Nike has been so successful as a company and why they pay Nadal and Federer so many millions of dollars each year. I try to choose the shoe that fits me best and performs the best. I'd only be brand loyal if I were the one being paid to wear the shoes. To quote Tyler Durden: You are not your khakis. I kept an open mind and tried other shoe brands: Adidas, Reebok, Lotto, Head, Wilson, Diadora, New Balance, K-Swiss, Yonex, etc. I ended up back with Nike. I just think Nike makes the best tennis shoes, IMO. Prince is also very good and a very close second. I've heard too much about power cushion to not give it a try. My only hesitation is the width in the forefoot. Lukhas, can you speak about the fit of the power cushion shoes? Lotto has long intrigued me, due to my Italian heritage, and it's prevelence on the tour. I actually can recall 3-4 pairs of Raptors being worn by some of my opponents this year in dual matches, tournaments, etc. About medium/average. The Power Cushion-D (for durable) are slightly wider in the forefoot than the Power Cushion Pro IIRC, but I'm not 100% sure. I can understand your position, but I don't think it is correct as a general rule. We'd probably find an equal number of people who claim that Barricades are the best tennis shoe ever made and one shouldn't consider other brands. For example, you loved BF2s and they killed my feet. That doesn't mean that I think that BF2s are bad shoes, just that they aren't good shoes for me. In my experience, Yonex shoes are better than Nike shoes for my feet. I think Prince are fairly good quality but I don't get as good of a fit as I do with Yonex. I can respect your opinion because you are willing to try other shoes. I do have a problem with people who are convinced Nike are the best because they pay millions of dollars to top athletes and they've only worn Nike shoes. I can understand your position, but I don't think it is correct as a general rule. I wouldn't consider it irrational considering the volume of success I've had in Nike shoes. I am loyal to success and Nike has been symbolic of that throughout my life. I also know for a fact that the air max cage last is one of the only performance show lasts that caters to my wide foot. And the vapor'a dynamic for system is one of the only shoes that stretches to the width of my foot during match play. I've tried my fair share of shoes. Other than Adidas and Nike, I've worn Babolat, K-Swiss, Prince, older Yonex models w/o power cushion. But I've never been confident entering a usta tournament or high school/ college dual match with anything but nike shoes. For a variety of reasons that are legitimate. This has nothing to due with what pros wear each type of shoes. I wear all three performance models Nike releases and I have no biases based on who is wearing what. I pick the best Nike shoe for my wide foot and some years I am forced to stock up on a previous model that I trust to play with in matches. For instance, I played with the Courtballistec 2.3 for in 2011/2012 because the 3.3 was awfully narrow, I hated the 2k series, and I was not too fond of the Vapor 8. I don't just throw any Nike logo on my foot, there is an extensive wear test process I go through annually when Nike releases shoes.. I am partial to Nike and will be for most likely the remainder of my competitive tennis career. Tennis is an extremely mental game, as we all know, and it's certainly not easy to make changes to footwear. Tommy haas violated several sponsorship contracts because he had a connection to the Nike brand and the way certain shoes fit him(I know he wears asics now). The entire purpose of this thread was to explore reasons why manufacturers are putting less cushion in their shoes, especially nike. I can attest personally that adidas is worse on the cushioning front, and babolat cushioning is also pretty despicable. Between those three brands, there aren't many college players out there wearing anything else. So I do see a certain trend to be aware of. I realize we've gone off topic, and you're doing a better job of defending your position this time. The earlier claim just made it seem that you have an emotional attachment to Nike based on your college playing days. If you've tried other brands and found that Nike works better for you, then that's really not an emotional decision. I'm just pushing for people to wear shoes that work best for them, and given the variations in foot shape and preferences, I don't believe there is a best shoe or reason to be loyal to a particular brand. You could just say I'm not superstitious nor do I tie my success and failure to brands. I haven't worn a Nike shoe since the BF2, so I'm not familiar with the drop in cushioning other than the information you've posted. Certainly Yonex shoes don't seem to have become less cushioned. I also wear Prince T22 shoes, but I consider them a little less performance based, at least on my feet. Thought this thread would be about Adidas Barricades.